We're sure for many of us, one of the great things about being an adult is that school dinners and packed lunches are well in the past…kind of. But now we’re all grown up, many of us have faced the realisation that we just can’t afford to eat out at Pret and then wash it down with a venti caramel latte from Starbucks every day, so the reality is we’re forced to make our own packed lunches. But that doesn't mean we can't do so in style! Forget used take out dishes and warped plastic boxes that will only lead to leaky soup and soggy sarnies, and instead invest in a funky adult lunchbox that will keep your lunch fresh and fully intact on your commute. There are a few different types of lunchbox you can get, depending on what kind of foodie you are. For those who like to have a hot lunch, a thermos that will keep your food warm all day is ideal, especially if your office doesn’t have a microwave or you travel around a lot when working. Bento boxes have become very popular as of late, as these are designed to keep certain parts of your lunch separate. That means you could use one section for hot food and another for snacks such as fruit. Some also come with plastic cutlery so you can eat on the go wherever you are. If you just want a stylish lunch box to carry your sandwiches in, then there are plenty of quirky lunch boxes and bags that make for a stylish work accessory. We’ve picked out a range of boxes to suit your lunches, so take your pick and make packed lunches great again. This stylish lunchbox is designed with practicality in mind. The bento box design means it has two tiers that you can use to separate out hot and cold food or different food groups. Users say this box is ideal for those who make soups and salads for lunch, but isn’t the best shape for a more traditional packed lunch such as sandwiches and fruit because the compartments are shallow. The compartments are microwave and dishwasher safe which makes them both versatile and low maintenance, but users have said to hand wash where possible to avoid warping and breaking the water-tight seal. Overall, this adult lunchbox is practical and stylish for your day in the office. Gentlemen can carry their lunch in style with this Langdale Lunch Bag that has a very country feel to it. This premium leather bag is surprisingly spacious inside, making it perfect for protecting your sandwiches on your commute. This bag is very stylish, but not very practical for those who usually have soups or salads for lunch, as it doesn’t have any keep cool or warm features. However, it does make a handy little bag for carrying snacks and other foods that don’t need to be kept in the fridge all day. This stainless steel lunchbox is ideal for those who are trying to eat healthier as the compartments help you portion out your snacks for a good balance. Users would say this definitely isn’t big enough for a full lunch, but that it is great for keeping fruit or salads in so they stay fresh all day. It should also be noted that this lunchbox is for dry foods only as it does not have a water-tight lid. 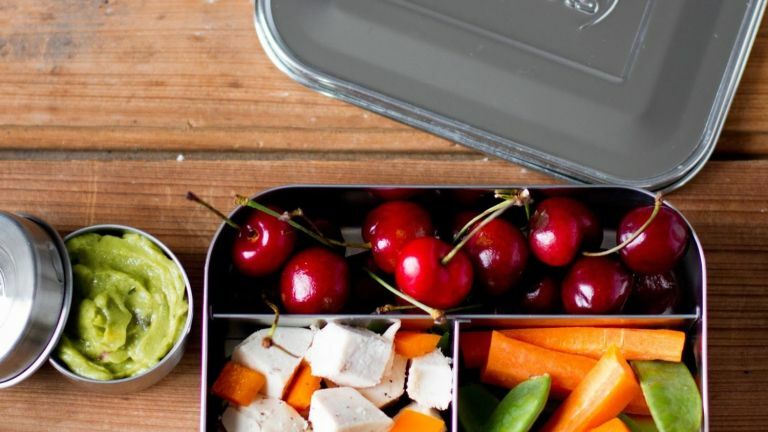 This lunchbox could easily fit in your work bag but you’re likely to need a separate tin for your main meal too. It can be really annoying having to carry your soup in one pot and a sandwich in another, or yoghurt in one pot and fruit in another. But with this double-stacked lunch pot from black+blum, you can eliminate this problem and keep all of your food together with this handy lunch box that comes with a carry handle and a plastic spork for ease of use. The only downside to this lunch pot is that it’s too tall for most fridge shelves, so you’ll have to get to work early to bag a space in the door! If your office doesn’t have a microwave or you’re constantly on the road for work, then a thermos is a great way to keep your lunch hot throughout the day. This thermos pot from black+blum is said to be ideal for keeping soups in as it has a vacuum seal and is designed to keep food hot for up to six hours. It also has a handy magnetic spoon that sticks to the side of the pot so you can be ready to eat your lunch whenever and wherever you are. The cork lid can be a little tricky to clean but the rest of it wipes clean straight away and customers were pleasantly surprised with the size of this pot for a substantial lunch. If you like to take the leftovers from dinner as your lunch the next day, then this bento box makes for the ideal container. It is one large dish that comes with a fork and separate pot for sauce which saves the dish from getting all mixed up in transit. Users who have this pot love how durable it is and it keeps food fresh throughout the day. The only downside is it doesn’t fare well in the dishwasher, despite being said to be dishwasher safe. You get a fork included which makes it easy to take this lunchbox wherever you go for a healthy homemade lunch.